I expect the unexpected when it comes to watching a movie. The other day I was watching this Tamil movie, Paruthi-veeran and without my knowledge I had tear drops welled up in my eyes in the end. Road to perdition was another movie which made me drop my jaw for a while for its strong philosophical lines. User discretion and excretion is necessary while reading the following line. Climax indeed plays a vital role in movies. I still remember the first movie I saw in a movie hall. It was The Ten Commandments. It was released in a Rated movie hall (Rajam Picture palace) in my town because English movies were not released in any other movie halls. I remember Moses ruling the roost in the movie. Instantly he became my super hero at that time overtaking street hawk, Poi’rot, Superman and even He-man. I was in class two then. My interest for movies developed with time and soon I started acting and directing my own movies in my dreams. My second movie in a movie hall made me biologically revolutionize my own pants in the movie hall. I was in class six then. The movie was Jurassic park. 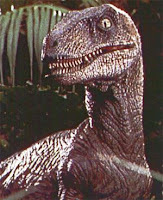 The dinosaurs often reminded me of my school principal. Many a days I had sleepless nights which resulted in my bed getting wet every morning. My folks never bought my story that I sweated lot because of the hot climate. Those were the only two movies I saw in my entire school life in a movie hall. Being the innocent guy who never knew the process involved in bunking classes, I missed out on a lot of extra curricular activities then. Soon I was in college and I never missed a movie in the movie halls in Pondicherry. I painted each and every single movie hall in the state. The innocence zoomed to new heights that I never bunked even a single movie. Now let me come to the reason behind this post. Last night, my old college-mate called me up and told me that he is in Trivandrum. His voice has changed big time. Then he had a screechy Britney spears voice. Now he speaks like Usha Udhupth. I still doubt his orientations. He also told me that he is waiting to watch a Hindi movie with me (He doesn’t understand Hindi. What ever I translate is Hindi for him). Once I translated the whole Hindi movie, Dil Chahta Hai for him. Later I came to know from an online-movie-review that Dimple Kapadia was not Akshay’s mother in that movie. Even today he believes each and every single line that I translated for him. But I won’t forget the help that he offered me when we watched the movie, Sixth Sense together. That fateful day we bought the tickets for the movie and as soon as we sat in our respective places, he came close to me and said, “Bruce Willis is the Ghost in this movie”. I never had a chance to take revenge on him. But last night when he called me, he asked whether I could accompany him for the movie, Om Shanthi Om. He wanted me to translate the movie. Tonight is going to be fun. Every Dog indeed has its BIG day. so you wanna play the bad man this time. will love to know what story you have cooked for your friend this time. there are some things in life we just cant forget, and first movie in a movie hall definetely tops that list.. my first flick was Manichitrathazhu..
and its nice that old college friends still get in touch with you.. i hope i dont loose touch with any of mine either..
Hmmm so the bed wetting was due to sweat?